LuangPu Phoo was born in the year of B.E.2373 at Tak province. 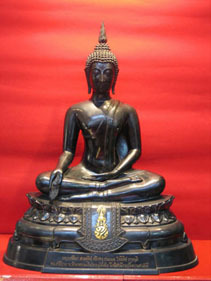 He became a novice at the age of 6 at Wat Thakhawy. At the age of 21,he became a monk and his precetor was Acharn Onn. He started to go Tudong with his brother LuangPho Yai. After he had mastered the skill of Vipassana,he went to Bangkok. LuangPu Phoo had ever resided at Wat Sakiat,Wat Sampluen,Wat Muangkay,Wat Thaitalad and Wat Intaraviharn. 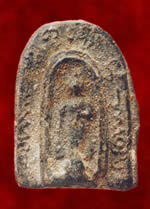 He was the abbot at Wat Intaraviharn from the year of B.E.2435 to B.E.2467. He got the title of Prakru Thamma NuKun in B.E.2466. 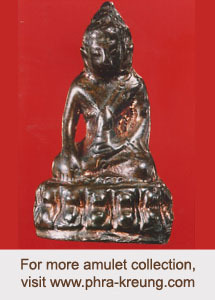 LuangPu Phoo was one of the very close disciple of Somdet Pra Puthachan (Tho) of Wat Rakang Kositaram (Bangkok). He had learned Vicha and went Tudong with Somdet Pra Puthachan (Tho). 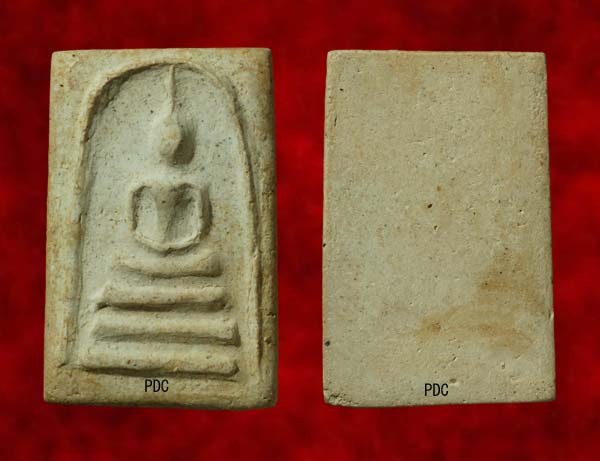 This piece shown here is the Phra Somdet Phim Song Jedi created by LuangPu Phoo of Wat In. A piece with an original texture maintain and beautiful form like this is hard to come across nowadys.